Workers compensation claims are intended for the benefit of employees who get injured while on the job. The compensation pays for lost wages, medical expenses, and other expenses while the employee recovers from the injury. Recently there has been an increase in worker compensation claims and many of them are considered to be fraud or illegitimate. Since worker compensation claims are hardly disapproved by the employer, it has become an easy way to use fraudulent compensation claims for personal profit. 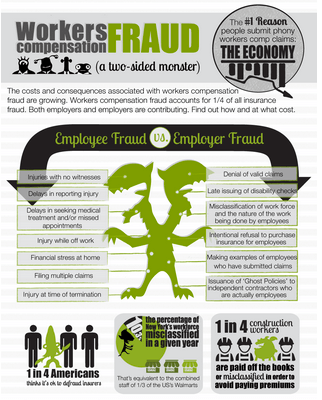 How does fraudulent worker compensation hurt businesses and honest employees? The increase of the fraudulent workers' compensation claims seriously affects the insurance companies. To deal with the increase in compensation claims, insurance companies increase the premium for such services and the cost is transferred to the employer. There have been cases where higher premium has affected the businesses to the extent which has resulted in the closure of businesses and people losing jobs. Hence, businesses need to be proactive when handling worker compensation claims. The best way to deal with fraudulent worker compensation claims is hiring a private investigator to find out the truth. Private investigators generally interview employees who seek worker compensation claims. The interview questionnaire contains all types of questions that establish every detail of the claim. The answers are recorded which can be used as evidence in court. Private investigators collect all documents such as photographic evidence of incident and treatment copies that are helpful to detect fraud. A basic research in worker compensation claims can reveal lots of information that is generally not gained through casual observation. A private investigator knows the right places and ways to conduct research and collect information that can tell about any existence of fraud. Evidence plays an important role in proving a fraudulent working compensation and denies compensation where the claim is not legitimate. A private investigator gathers a considerable amount of evidence that can be used to determine the right amount of compensation whatever is applicable as per the law. Amy Screamer is a professional guest writer who is interested in writing articles related to investigations and security on behalf of Panther PI. Panther PI offers a range of investigative services in professional standards.